In the 1970’s, his trial work was primarily civil. However, he successfully represented four defendants charged criminally with first degree homicide. In one instance demonstrating his skills as a trial lawyer, he pursued in the Superior Court, Law Division, a products liability case on behalf of a plaintiff, who had suffered serious injuries as a result of a machine related accident at work. 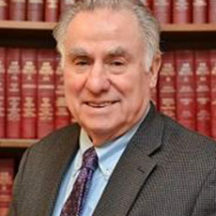 After the motion for summary judgment was granted on behalf of the defendant manufacturer at the trial level and affirmed at the appellate level, he successfully argued the case before New Jersey’s highest court, That written decision by the New Jersey Supreme Court reversing the trial courts’ in favor of the plaintiff significantly changed New Jersey product liability law and had an impact across the country in products liability litigation. Up through the present time, his practice exclusively deals with civil tort litigation (personal injuries), including professional malpractice and employment law on behalf of clients who have suffered serious injuries or incurred substantial damages, including employment discrimination. Mr. Cardonsky has had verdicts and settlements in medical malpractice and products liability cases for 1.5 million, 1.6 million and 2 million dollars and thousands of other substantial verdicts and settlements on behalf of his clients throughout his lengthy legal career.